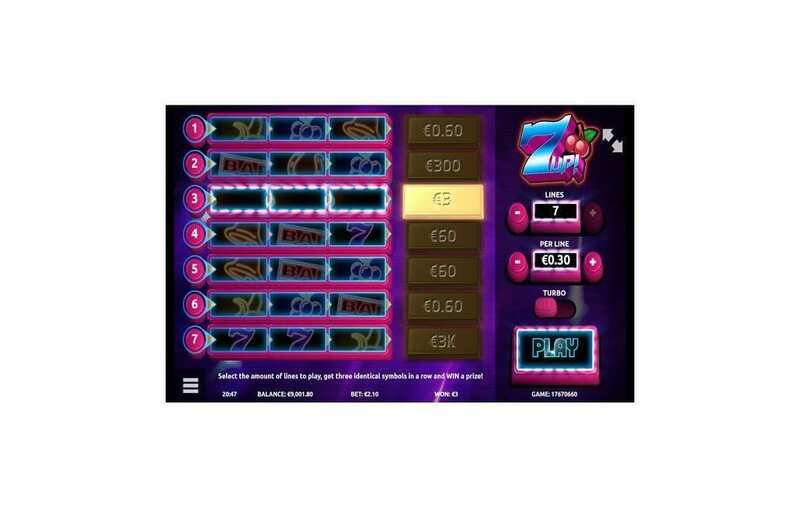 Seven is one of the luckiest numbers in the world of casino gaming, and it is undoubtedly the lucky number of this slot machine 7 UP. The slot has five lines with three reels, and it is reminiscent of classic slot machines. It has simple fruit icons with pretty straightforward gameplay. You will choose a bet that can amount up to 1000x on each spin. 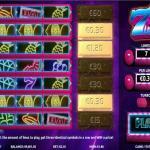 The slot machine design follows the one for retro fruit machines, also called one-arm bandits. You will notice that through its visuals, setup, icons, and gameplay. So get ready for a nostalgic experience when you give this slot/scratch card game a few spins. 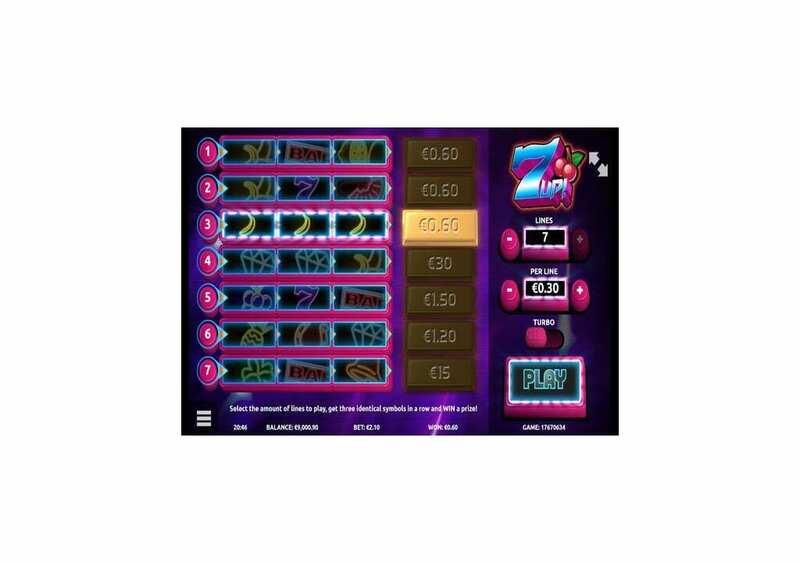 7UP by Gamevy is a classic fruit machine that has five paylines with three reels that will provide you with a nostalgic experience. 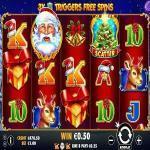 It is all about fruits and the usual icons that take after the classic-slots that we used to play and enjoy at the bar and land-based casinos. So whenever you decide to give the slot a few spins, you know that you will be in for one heck of a classic ride, where 7 is the lucky number that you should keep your eye out for as you play. You can do just that here for fun and see what it has to offer. 7 UP might pass as a slot machine because it has lines and the symbols spin on them, but at heart, it is a scratch card game. 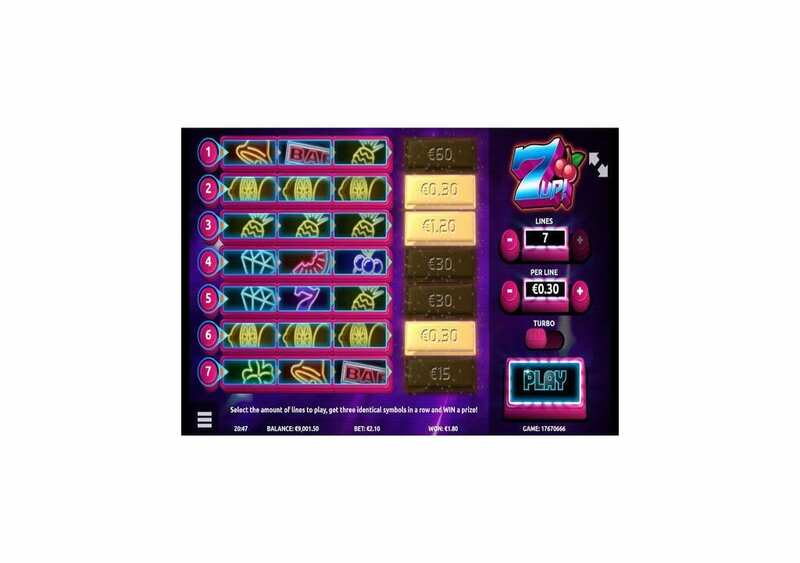 The slot machine has multiple lines, and you will only have to get matching symbols on the same line to claim a reward. The slot/scratch card is from the gaming selection of Gamevy. Gamevy has a lot of slot machines in its portfolio, and this game might look like a decent addition to its collection. It has the potential for significant awards that can amount up to 10000 the stake. On the other hand, 7 UP lacks any intrigue and suspense because it does not have any unique symbols or bonuses. So behind all of the fancy setups, the visuals, and the neon lights, it is still just a regular scratch card with seven winning chances that have a fruit machine theme. At first glance, just from the name, some might think that the Pepsi Corporation has entered the world of online slots through a slot that is named after its favorite drink “7 Up”. Sadly, this is not the case, as the slot machine/scratch card is a classic slot that revolves around the lucky number 7. 7 Up does not have a story or theme that it revolves around. The reason behind that is the fact that the slot machine/scratch card is all about the classic slot machines. Therefore, all of the icons and the graphics of the game are classic and will immerse you in a nostalgic experience. So whenever you play 7 UP, you will enjoy a nostalgic fruit-machine gaming experience that has fruits, bells and more. 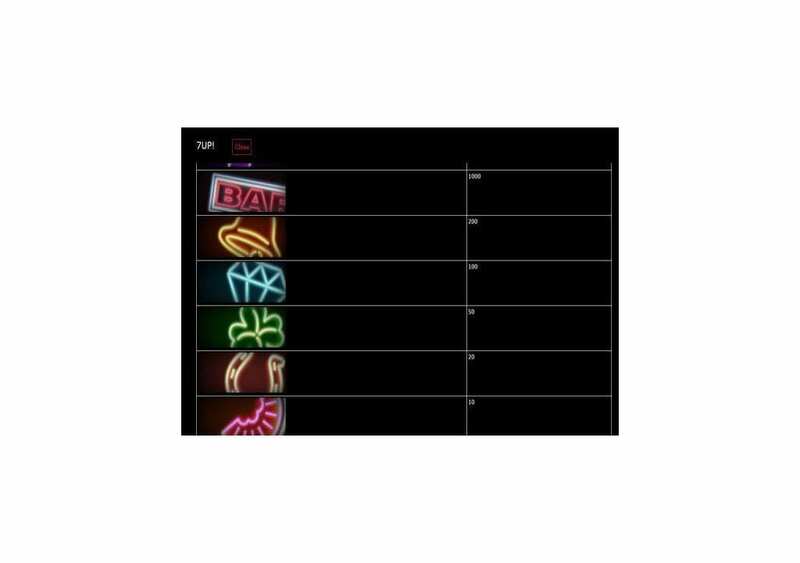 It has a modern twist, as the visuals are not that basic with neon lights as the outline of the symbols. So if you want to relive a nostalgic experience that reminds you of pubs and land-based casinos with a modern twist, then 7 UP is the game for you. 7 UP’s screen has two parts. The one on the left is the slot itself where the symbols will appear. You will see seven rows that represent the seven lines of the slot/scratch card. Each row or line has three symbol position, and you will need to get three matching ones to claim a reward. On the right side of each line, you will see a golden rectangle that will show you the award you earned for that line. Underneath the reels, you will see the total bet, and total amount won for that round from all the lines. On the right side, you will see the control panel. It is where you will the number of rows you want to activate (1 to 7), the amount placed on each line (from 0.02 to 10). 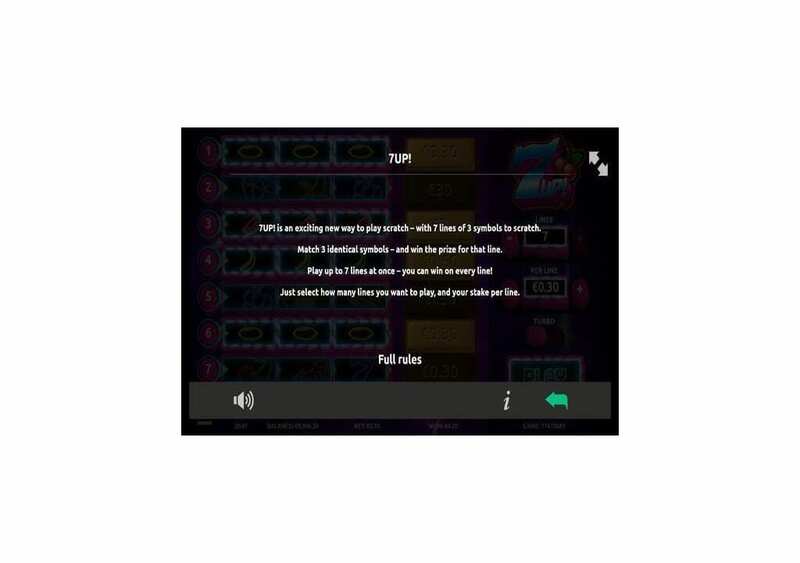 You will also see the Turbo option ogle and the Play button to initiate the gameplay. As for the symbols, they include the neon symbol that depicts different fruits, diamonds, 7s, bar icons and other classic symbols. 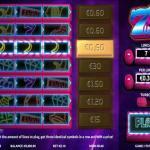 7Up game bounces on the line between scratch cards and slot machine. Therefore, the only way to claim a payout on this game is to get three matching symbols on any of the seven lines of the game. 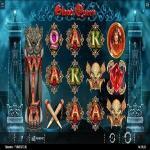 Each symbol has its reward, which is in the form of a multiplier of the stake that you placed. The theoretical payout percentage for this game is equal 92.09%. The highest payout that you can claim is equal 10000x the stake. You can earn that payout whenever you manage to get three matching 7s on the same reel. As for the lowest payout that 7UP can give you, it is equal 1x the stake, which gives you back what you placed in stakes for that round. You will claim that 1x rewards when you get three cherry symbols on the same line. All bonuses from the lines are added together to result in the total award for that round. 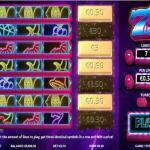 7UP might have the definite look of a slot machine, but at heart, it is a scratch game. 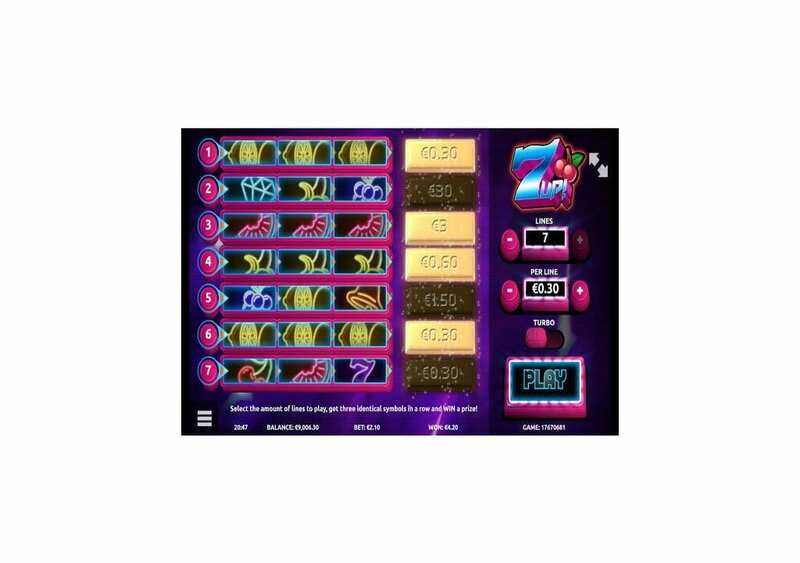 So you cannot expect to find any bonuses or features, as the only way you can grab a payout is by getting three matching symbols on any of the seven lines of the slot machine. Therefore, you can expect a pretty classic experience whenever you start playing this slot machine/scratch card. The lack of any wild icon or a unique feature is indeed a downside to this Gamevy slot machine because even a slot machine a simple as this should come with some Features.